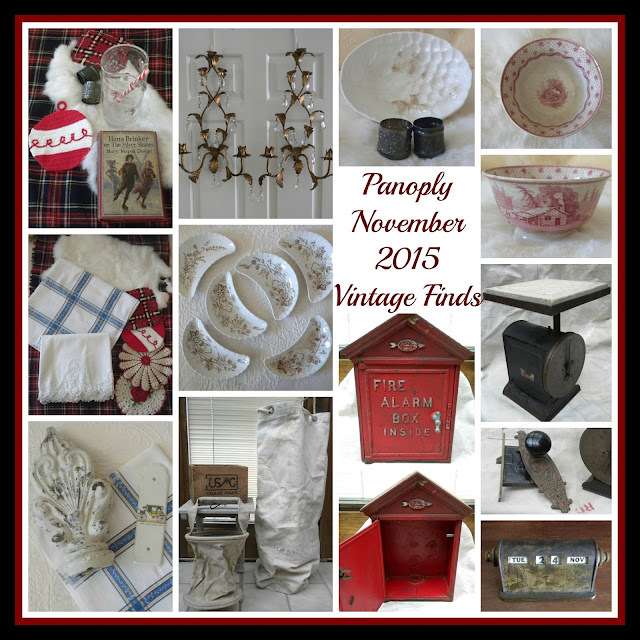 Panoply sisters were on a mission in November to get some junk and get out of a recent funk. 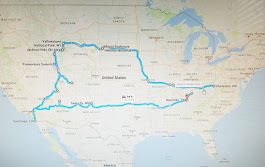 This will likely be the last good buying trip before the year end. I'll share my loot with you now, before it gets swept aside to make room for my household holiday happenings. First up are a few things that I will use in my own decor this holiday season and into winter. A plaid wool table runner/throw; a potholder made on one of those kids' weaving looms (in plaid! ); a white rabbit fur skin; two silverplate napkin rings (see photo near end of post for the monogram on one); a martini pitcher with a candy cane swizzle stick and candy canes embossed in the pitcher itself; a 1923 edition of "The Silver Skates" book (inscribed December 25, 1924 inside the cover); and a great, hand-crocheted ball ornament potholder. I can't pick a favorite out of these. They all make me smile, and several are additions to my already fairly large collections (the potholders, napkin rings, and plaid throws. 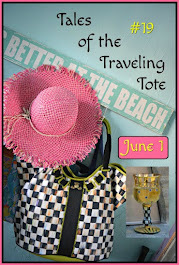 Typical for each of us Panoply sisters, we gravitate toward textiles. 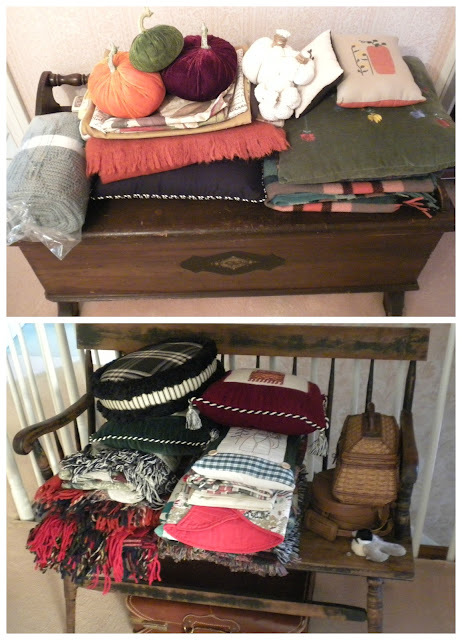 I came away with an assortment of vintage textiles, as seen together in the photo below. The white pillowcases are trimmed with tatted edging, very nicely done. 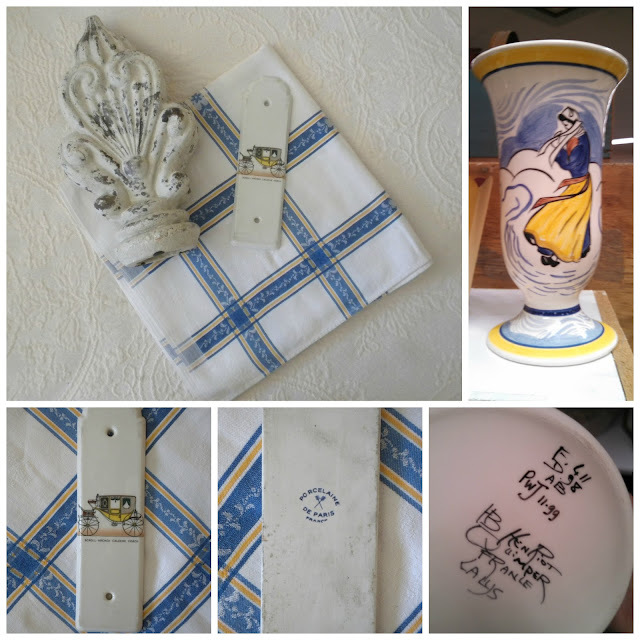 The French cotton damask tablecloth is one of several classic, Provencal color schemes in a blue, yellow and white pattern. I had a theme going, but one of the items below did NOT come home with me. Can you guess which one? If you guessed the Quimper table vase, you were correct. I know, I know. It's the one that got away, the one item I keep thinking about. The porcelain door push with carriage on it was interesting to me, mostly because I have one with a black toile print on it already (same backstamp) which I had ordered directly from Simone at Fleaing France over a year ago. The fleur de lis is a terra cotta architectural piece. It has a hole in the base, and looks as if it could be a cap for something (what, I don't know). And how about these beauties pictured below? There's definitely a danger in buying things you love. I actually have a wall in my guest bedroom on which these sconces would look great, but I'll have to ponder on that idea. Our first thought, when shopping, was they would be good in a late winter vignette in one of our booths, after the holidays. A few industrial items were also part of my finds on this trip. Below, you see a USMC (not US Marine Corps) wooden crate which once held (sewing) eyelets; a military canvas duffel bag (with stamped initials RC and LAW PL); and lastly, a collapsible French military canvas tool bag. 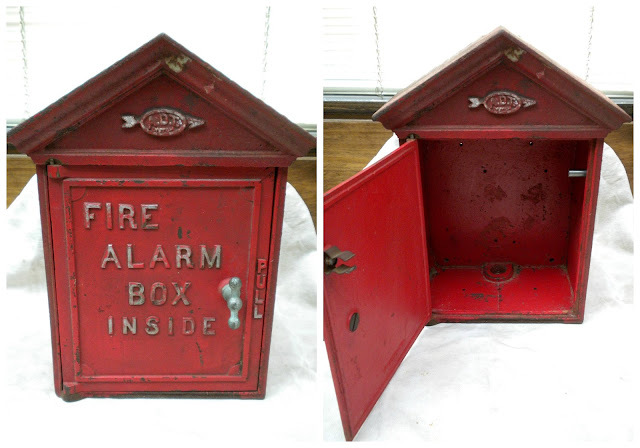 Additionally, I spied the vintage, cast iron Fire Alarm Box below, and made an offer on it, which the dealer accepted. This box could be great repurposed as a countertop liquor cabinet (a bottle with a couple shot glasses? 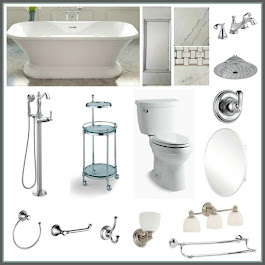 ), a place to store hot sauce for a grillmaster, or even storage for toiletries in a bath (maybe Pepcid AC or Pepto Bismol for fiery stomach, or air freshener for....well, you get the idea). Of course, I have a son-in-law who's a fireman, so.....we'll see if the alarm box stays or goes to the booth. 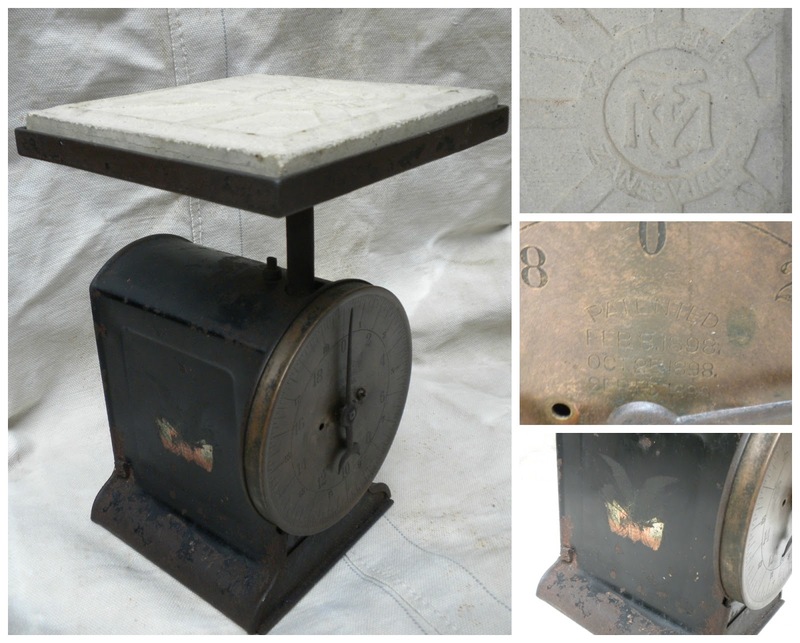 The kitchen scale below is different from most we've come across. It's got a tile on the metal frame that's marked "Mosaic Tile Co., Zanesville, O. ", and imprinted patents on the face: Feb. 8 1898, Oct 25, 1898, and Sep 15, 1899. There's an eagle decal on each side. I love the patina on the face. Ironstone was not prevalent, and most pieces I saw were pretty pricey - except the ones pictured below, which I added to my picks. 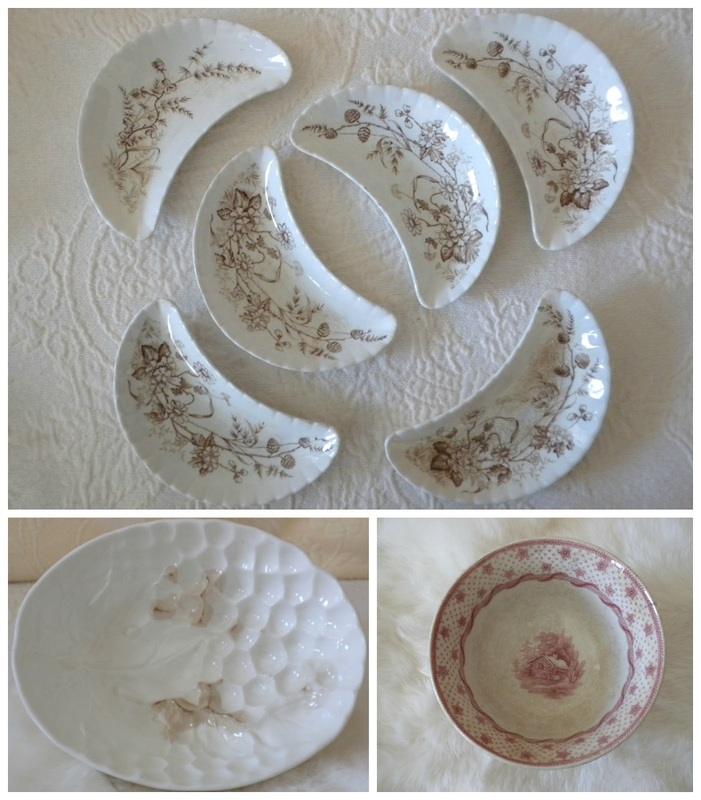 Six brown transferware bone dishes (English, John Edwards, in Daphne pattern); a petite, red transferware bowl (English, Ridgway, Columbian Star, featuring President Harrison's 1840 election and pioneer roots); and a white ironstone pudding mold (iron leaching - which I love), in grapes and leaf motif (backstamp indiscernible). 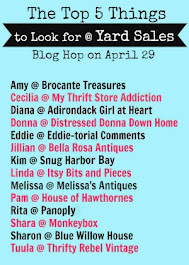 Of these, my favorite is probably the Ridgway bowl, even with its hairline rim crack. I love the cabin depicted, with smoke coming from the chimney. 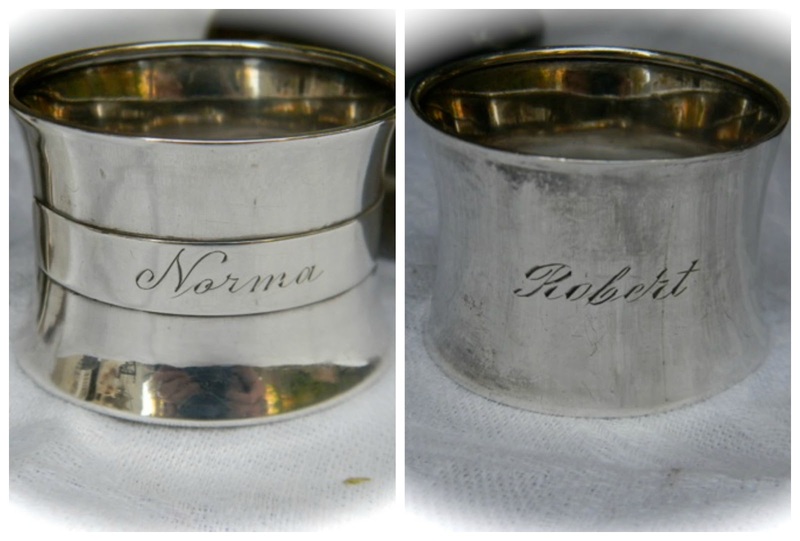 I mentioned above that one of the napkin rings has a monogram (something I look for to refine my selections in collecting these rings now). I love that, in this holiday season, I found the name 'Clara' (a la Nutcracker). The other ring was purchased because it was just too good a deal to pass up. 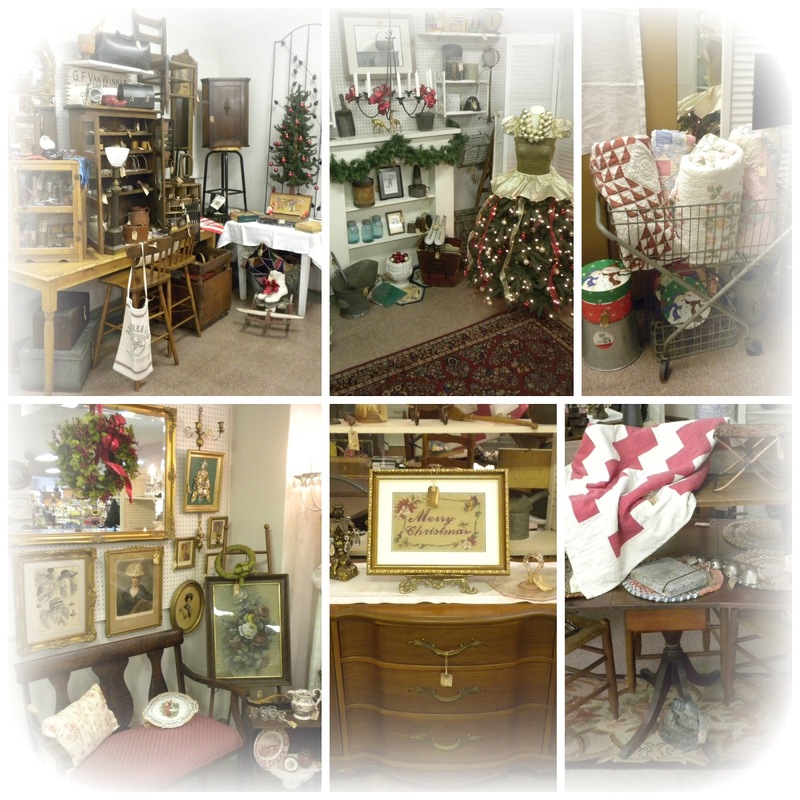 Adding a vintage desktop perpetual calendar and Victorian door handle /lock / backplate (seen in lower right corner of collage below), that's it for the vintage finds in November on this particular buying trip. 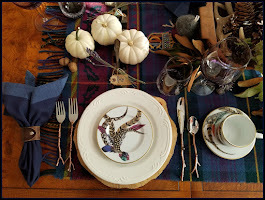 In a November purchase separate from the trip with my Panoply sisters, I bought the two napkin rings pictured below (a holiday hazard, as I plan my buffet spread for typically 30 family members or so each Christmas Eve). Both monogrammed, both names of family members (Norma was my mother's given name). Each are engraved with dates on the back (1915 and 1933, respectively). They came to me polished, but my preference is unpolished. One last token item, which I picked up on an out of town day trip with Mr. P., where he delivered his final expert testimony of his career (I shopped while he worked). An RPPC (real picture postcard), it's of a little girl in her winter finery, complete with a fur hand muff with a bear's head in the center. It'll be added to my collection of purse ephemera. 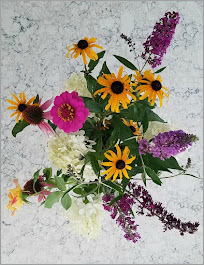 My objective now is to try to keep focused long enough to complete putting the garden to bed and getting the house holiday ready. With the extended days of warm weather we've been having, it's really been hard for me to want to stay inside and pull out all the holiday decor. Is this what it feels like in Florida at Christmastime? Also, the email blasts from retailers for all their huge price savings have been totally distracting for me. Am I the only one who puts all sorts of stuff in the online carts, calculates all the promo code savings (I love stacking them), only to step away (which prompts more emails reminding me of the items in carts)? It's actually a pretty good way to satisfy the impulse to shop, but it sure wastes a lot of time if you don't finish what you start. 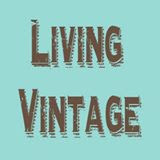 Remember, if you'd like to see more of my posts on vintage finds (or any other topic), just type keywords such as 'vintage finds' in the "Search This Blog" block on my right sidebar (just above my profile picture). Several posts should come up for your reading pleasure. 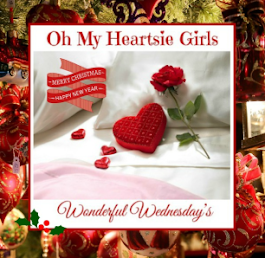 Hello, readers! 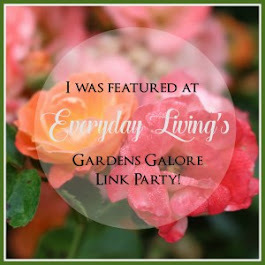 It's been awhile since I've published a post, I know. 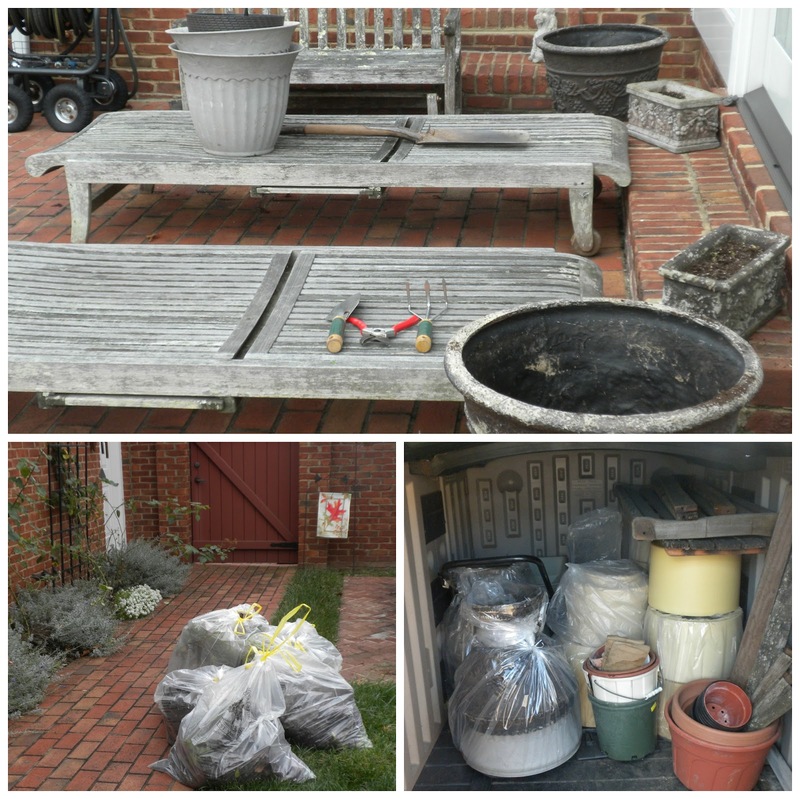 Lots of changes going on, all around, in both my home and garden. 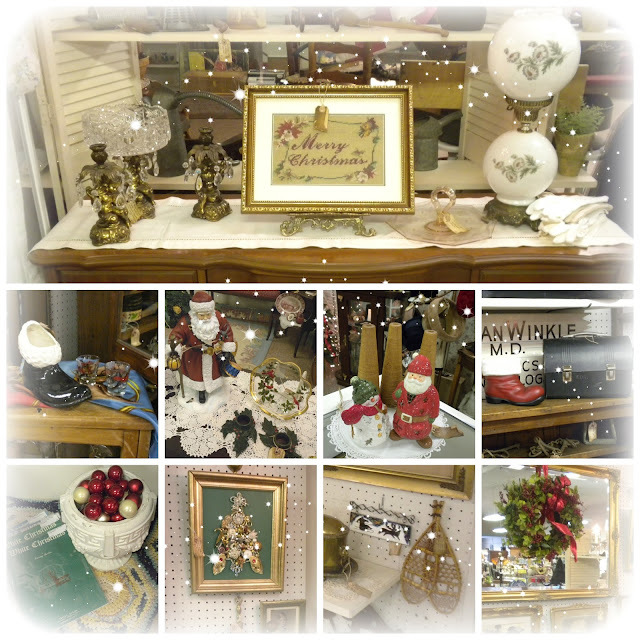 I've been UNdecorating fall, and just beginning to decorate for the holidays and winter. My front porch is going through an identity crisis. I've been trying to keep things from looking like a Halloween/Christmas transformer of some sort. 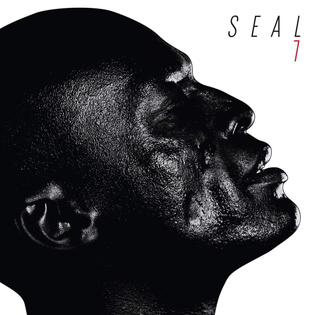 After this week, all holds are barred. 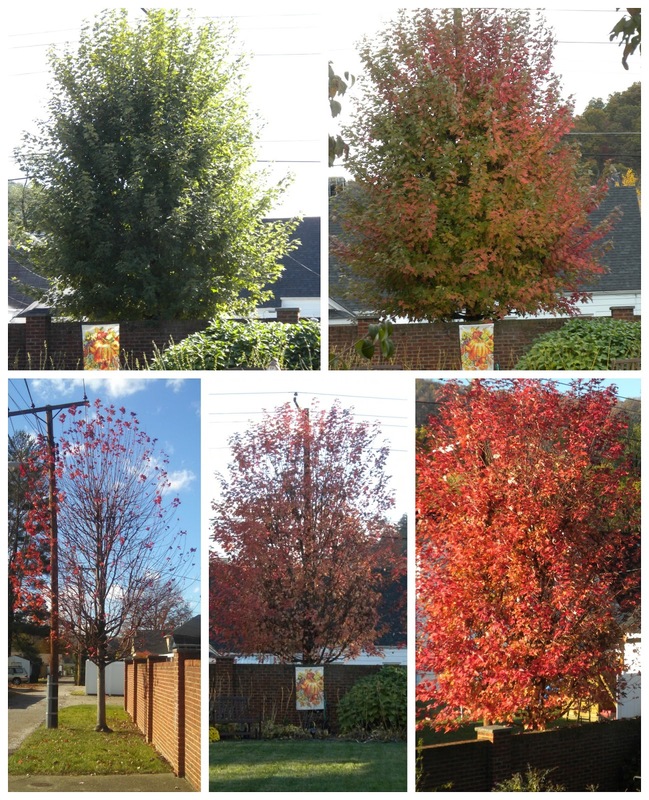 Almost all the leaves are gone from the trees here, and 2015 did not disappoint with the changes we love to see in our region (and our own backyard). Last night's 25° will surely take the remaining leaf survivors. Containers are all cleaned out and put away, outdoor water sources are turned off, and hoses are now covered for winter. 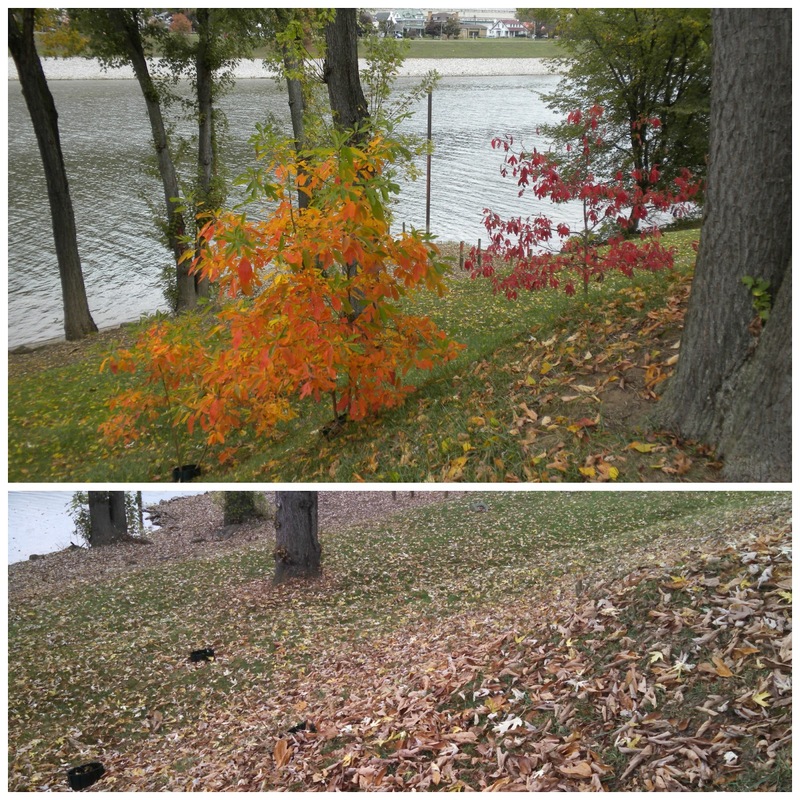 A most disturbing event occurred on our riverbank in early November. All of the sassafras saplings we've been nurturing, at least more than 5 years in one case, were taken down in one fell swoop. At first we thought it malicious mischief by kids, but we've since discovered it was animals - most likely beavers making their home(s) down river. 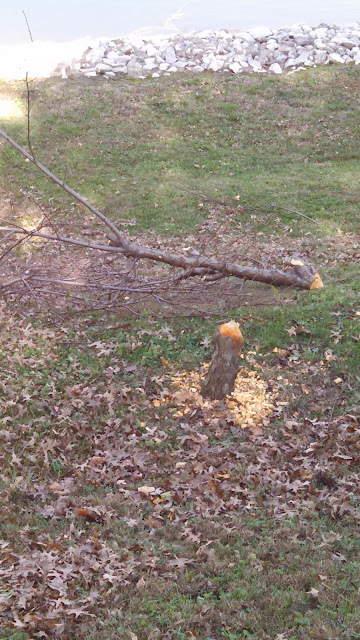 We know this by witnessing a neighbor's peach tree suffering the same fate a couple weeks later, with the evidence clearly remaining behind. 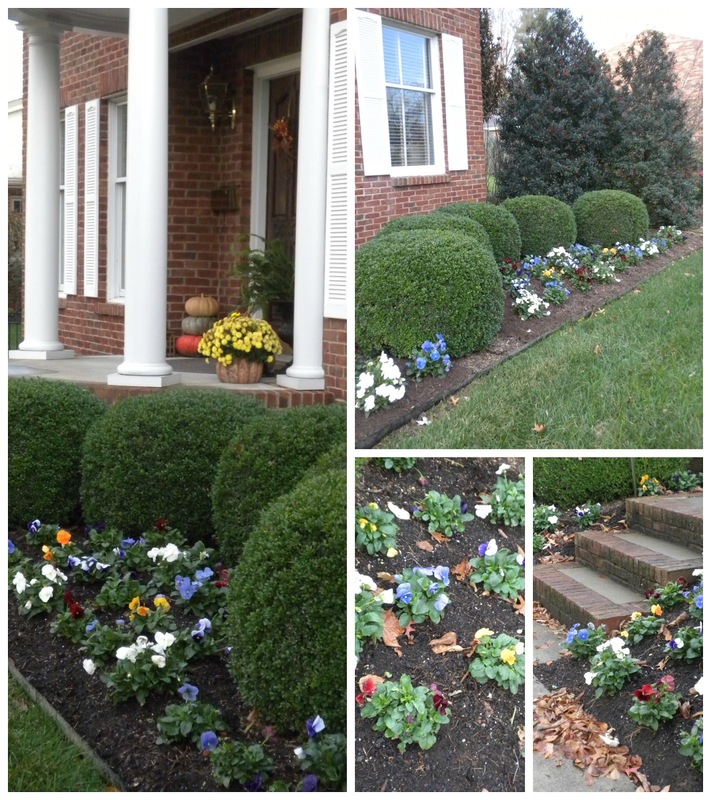 I love seeing the garden get cleaned up, and the beauty of the pansies planted in the annual beds. These little smiling faces will be my saving grace as the weather otherwise wears on my psyche in the coming months. Oh dear, I nearly forgot to mention some other pretty major transformations experienced in the last month. My desktop has been upgraded from Windows 7 to Windows 10, and I also purchased a new tool - a Microsoft Surface Pro 4. It's been a fairly smooth transition, although it did take an entire day to organize photos, documents and music to the OneDrive. 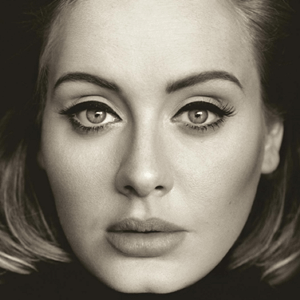 Funny, each of the above artists' new releases are identified by numbers, something I can identify with. That's another area I've been busy with over the past month - working on estimating our household's tax position, planning optimal outcomes. Mr. P. is almost completely retired, and that prompted new strategic planning and "what-if" scenarios. One thing which has remained constant in the past month or so, and that is Panoply's continued quest for fun finds. 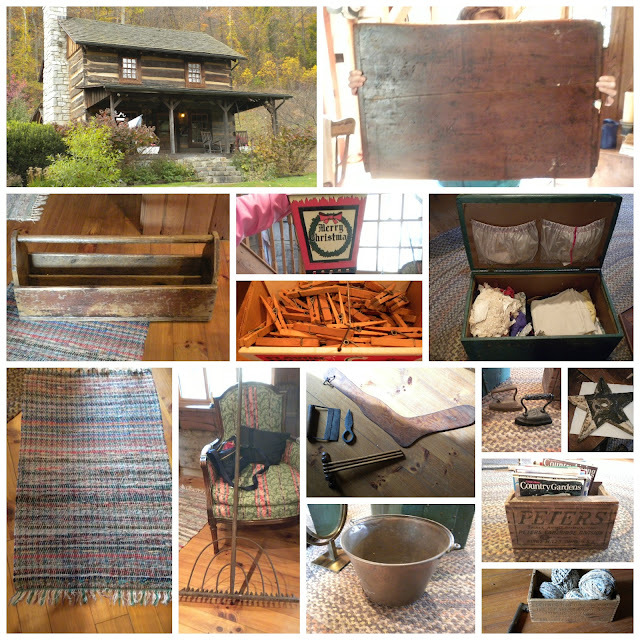 We were fortunate to be invited to a friend's 1740 cabin and adjoining farm to pick a few items prior to her sale of the property. It was a bittersweet encounter, indeed, and we were sensitive to the situation. We chose a varied assortment, mostly primitives and, just this past weekend, divided the choices among us three sisters. In a funk, in a need of more junk, sister M and I just returned from Cincinnati this past weekend. 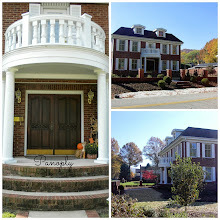 Always a fun time, we explored our favorite haunts, and came away with more picks. A pick post may be in the near future, but the more likely scene will be my getting the house in holiday style. 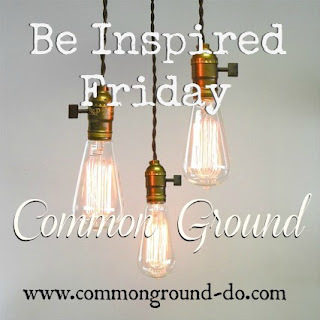 As always, your visits, comments, and loyal readership are welcome, and much appreciated! As part of Panoply's holiday booths 2015 decor, my sister and I created 'Chris Missy' - a unique Christmas holiday tree, fashioned from various components, both vintage and new. This post is a tutorial on how the tree was created, a step-by-step instructional guide, designed for those of you interested in assembling one of your own. As I stated in my last post, the concept of this tree is not new, as there are many of these type trees styled by others, whether you check Pinterest, read blogs, or visit major retailers such as Anthropologie. I'm sharing how we created ours so you can see just how basic (or elaborate) you can develop the concept. 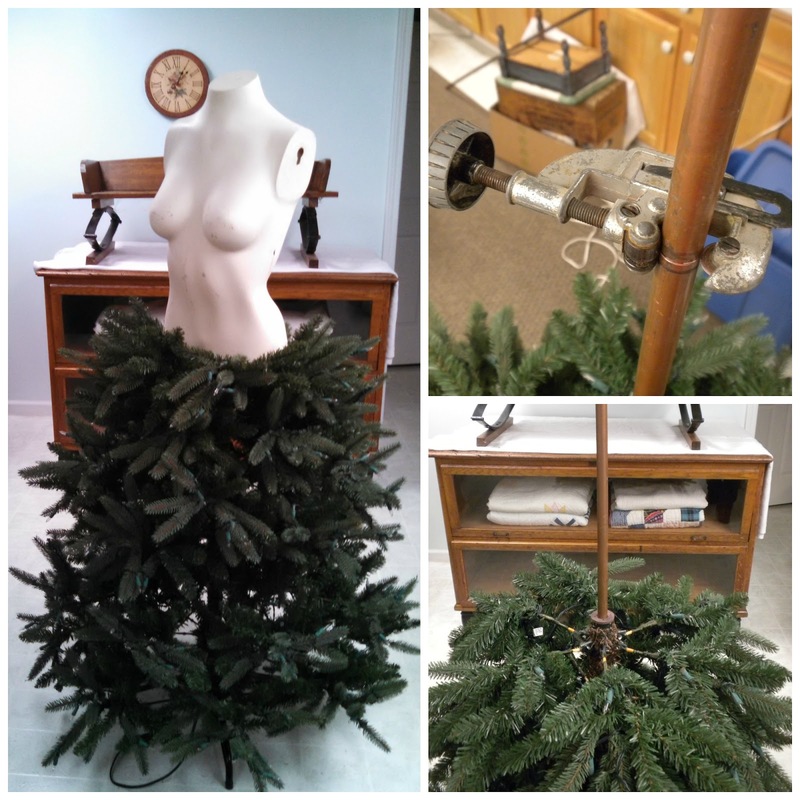 The primary components for 'Chris Missy' include: 1) an artificial tree section and base (we used the middle section of an individually strung, pre-lit 7' slender tree, along with the original metal base stand it came with); 2) an upper body (torso) mannequin; 3) a slim pipe (to attach the mannequin to the tree base); and 4) 10 packages (15 count each) of Dollar Tree ornament bulbs for trim. 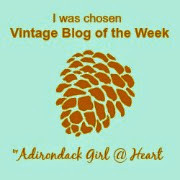 We also used wired ribbon (Sam's Club has great choices), and vintage clothing. Once we gathered our supplies, we found a pipe to fit the base of the tree, but needed to cut it to size (approximately 2'). With the right tools, any job can be easy. We used a plumber's pipe cutter, and the job was like slicing butter - so easy. We tamped down the pipe into the tree base with a mallet to secure it, and then inserted the mannequin torso over the pipe (the mannequin had a pre-drilled hole in the center of its base). We then dressed the mannequin, first slipping a 1970s glitter tube top over it. The peplum was from a stored ballet costume, and its elastic waist fit easily over the waist of the mannequin, creating a nice transition into the tree base. We quickly moved onto creating a "necklace" from the gold-hued bulbs. There are no photos for this part of the tutorial, but we simply used a long strand (about 2.5') of waxed dental floss. The strength of floss as thread was a trick learned long ago, when sewing ribbons on pointe shoes in my ballet days. We began stringing one bulb on at a time, centering it on the floss strand, and then tied the floss (once) after each bulb was added. We did this with just the first eight or so bulbs, to get a center cluster. After the initial eight or so bulbs were strung, we continued adding bulbs from each side of the strand, until it appeared full on the neckline (nearly 3 dozen bulbs). We did not string the bulbs completely around the neckline; instead, we left the floss unadorned from shoulder to shoulder. Holding the "necklace" around the mannequin neck, we tied it once we were satisfied with the appearance of the drape. The ballet costume from which we took the peplum also had pouf sleeves, so we added those to the tube top with a tack stitch on both front and back for each sleeve. 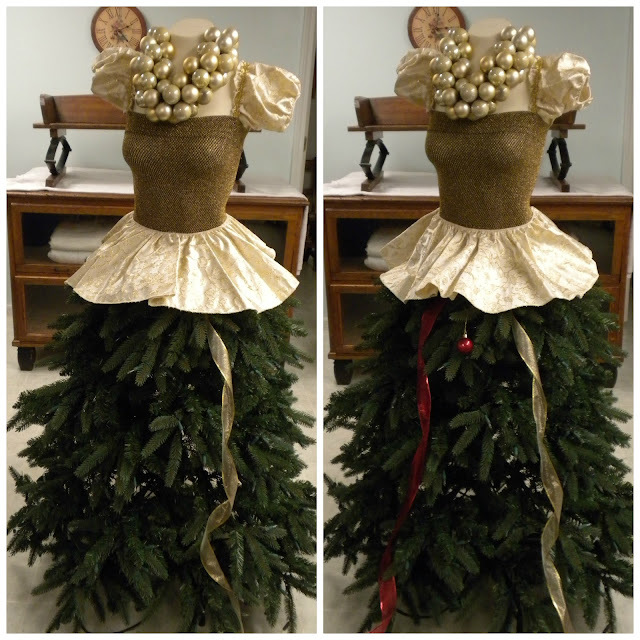 We next focused on the tree base, and decided we would alternate the wired ribbon trim around the "skirt". 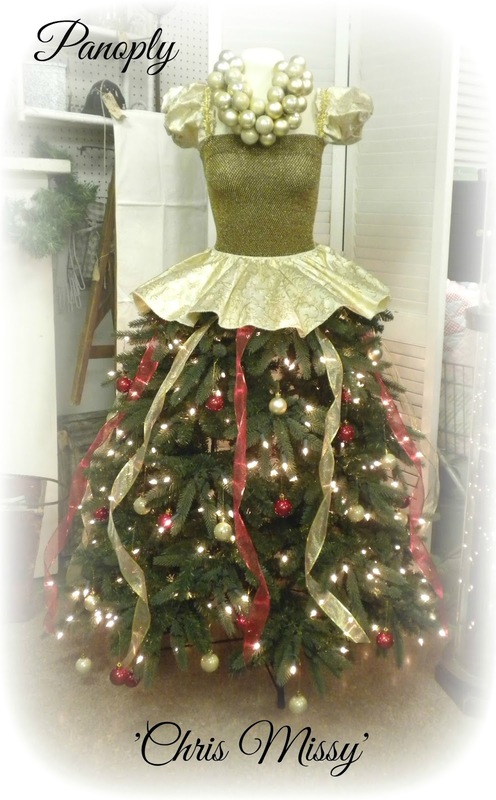 We simply tied each strand at the top of the tree's base (under the peplum), and then loosely twisted each strand for a ribbon candy effect, and cut each strand. Pleased with the concept realized, we decided to finish the trimming once we took the tree into the antique mall, where we rent space and sell our vintage and antique items. 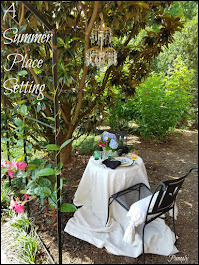 If you notice the clock in the sequence of photos here, the entire process (excluding gathering the supplies) to assemble the concept took approximately two hours. 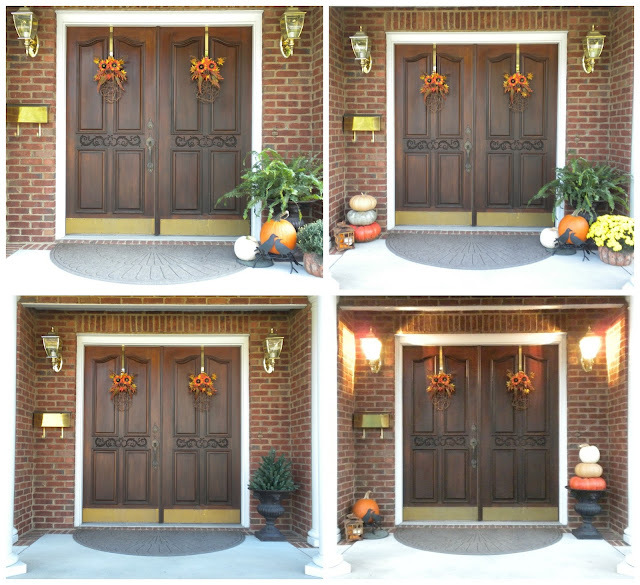 The possibilities are endless in terms of how much time and money one could spend on decoration and design. We intentionally went for simple elegance. Once transported to the antique mall, we assembled the main components swiftly, and then spent an additional hour or so stringing the ribbons and hanging the remainder of the bulbs. 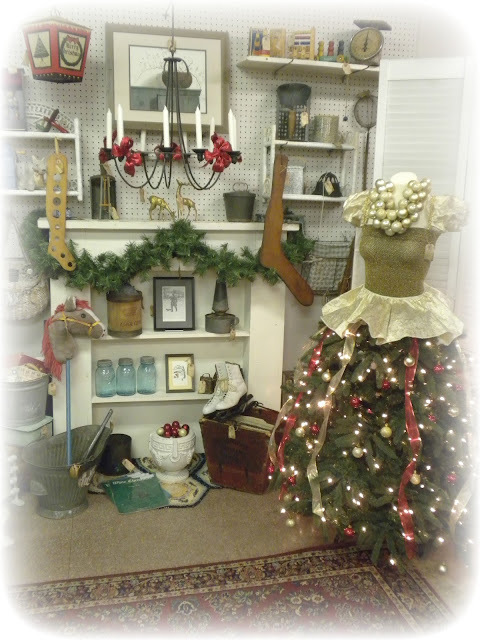 The photos above and below show the Christmas tree on display in our antique booth space, standing nearly 5' tall. The small, concrete urn on the floor (center of the faux fireplace) has about 1 dozen or so of the remaining bulbs that we did not string. 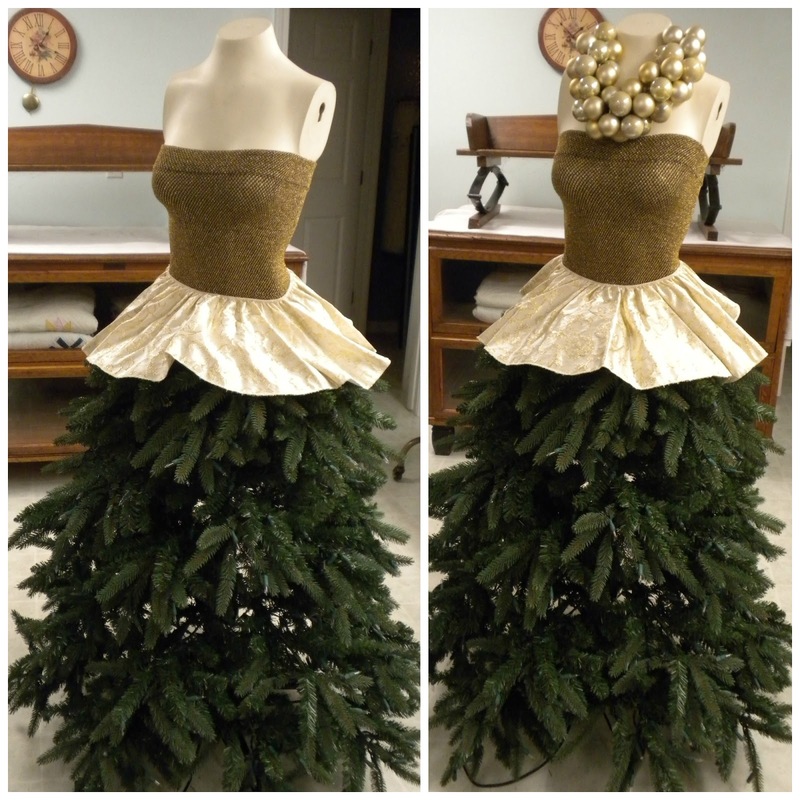 Feel free to pin the image from this original post so you can refer back to the ideas and tutorial on how we created our 'Chris Missy' Christmas holiday tree. Again, the sky's the limit as to how you may want to create and embellish your own 'Chris Missy'. 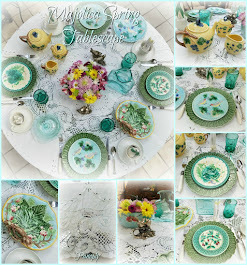 A special thanks to the following for featuring this post: Kathryn at The Dedicated House's 'Make It Pretty Monday #157', Diana at Adirondack Girl's 'Vintage Charm #5', and Jillian at Bella Rosa Antiques' 'Let's Talk Vintage #57'! Panoply started its 2015 holiday decor staging on October 20th in three booth spaces, while many of the dealers in the antique mall were still focused on Halloween. Sister M and I were excited this year to set the staging with our creative effort, which came together in early October, and we now call 'Chris Missy' (photo below). 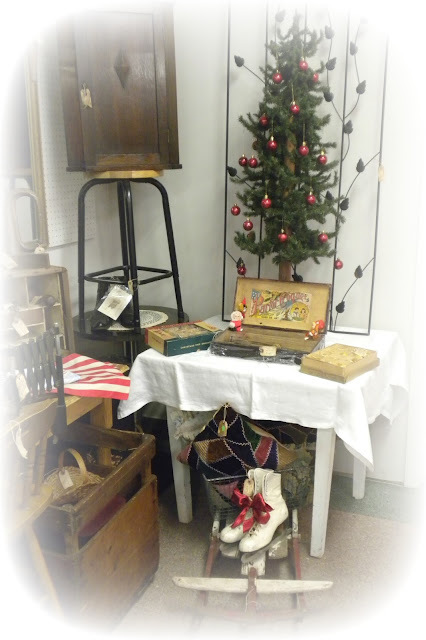 Our 'Chris Missy' Christmas holiday tree was to be our central focus in our main booth space (and is priced for sale). With a few moves of a large cabinet from this space's corner to the back side of the louvered bifold behind her (the area we recently dubbed the back porch), we had the makings of our holiday styling in place. A very nice, vintage wool area rug was placed on the floor of this space (a convenient, 4' x 6' size). We hung greenery on the faux fireplace, and added bows and candles to the primitive chandelier. Other small decor items were scattered throughout, including vintage skates and holiday-themed prints, just enough without screaming Christmas. We quickly moved on to the next large vignette we wanted to stage, which was based around the circa 1800s buggy bench sister J had recently purchased from our dealer friend's living estate (see pictured below). The bench was a little too long for the area originally targeted, so we settled for another high traffic corner of another of our spaces - the area we currently refer to as the keeping room - on top of the petite dining table. Another pair of vintage ice skates hangs on the chair on the left, while several related items to winter travel of old surround the buggy. 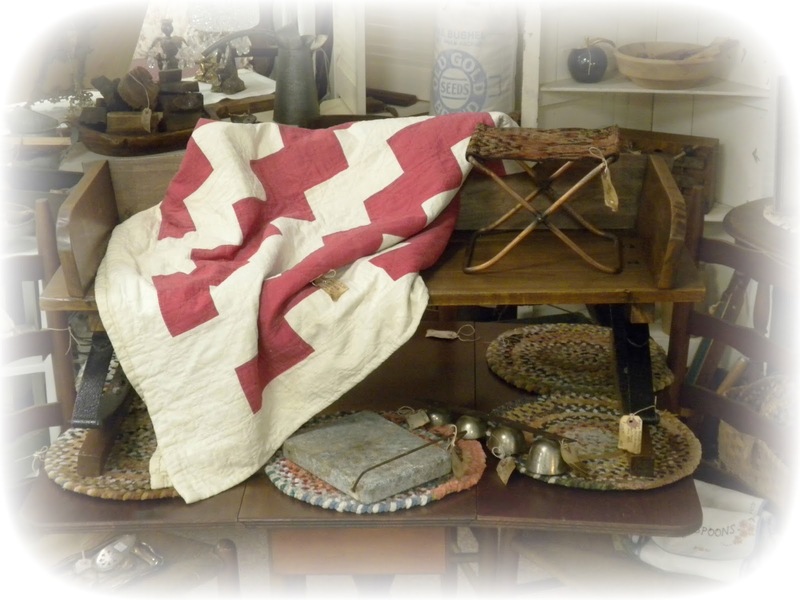 Panoply Christmas 2015 "The Keeping Room"
A closer look at the buggy vignette detail shows an old quilt on the seat, as well as a buggy booster seat of old. This, too, came from our dealer friend's estate - unique and all original - with its carpet-stretched seat. 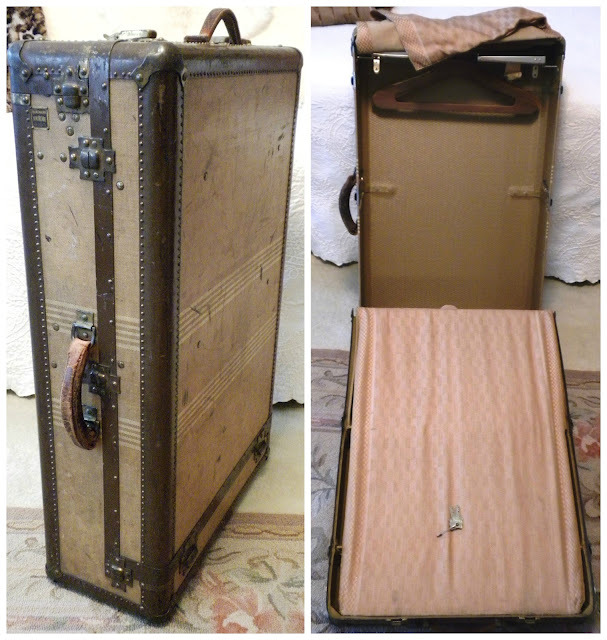 Some of these, back in the day, would also have had another piece of carpet stretched on the lower frame, to create a shelf for travel storage. Two other luxuries for early days of travel would have been the foot warming stone and sleigh bells (on the table). The romanticism of this vignette almost makes me wish for snow. Almost. The last main area we staged for the holidays was the table on which we had hoped to place the buggy bench, situated in the booth we call the encampment space (below). 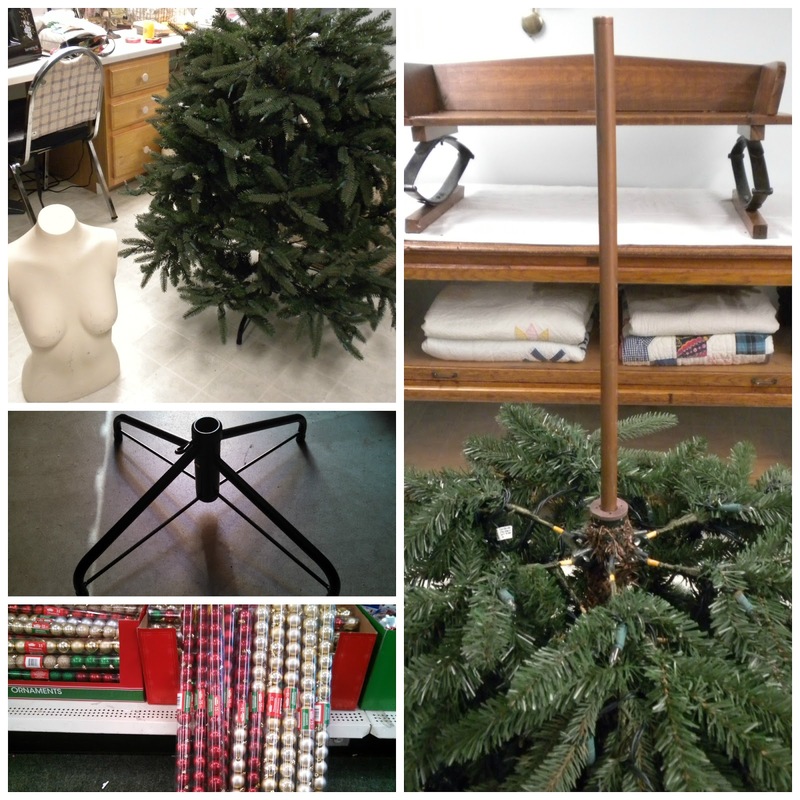 With the surface area of the table being too narrow for the bench, we made this the staging area for another, smaller tree we use for display purposes only. On the table now are a couple (original) packages of vintage ornaments, along with an antique, parlor croquette set. 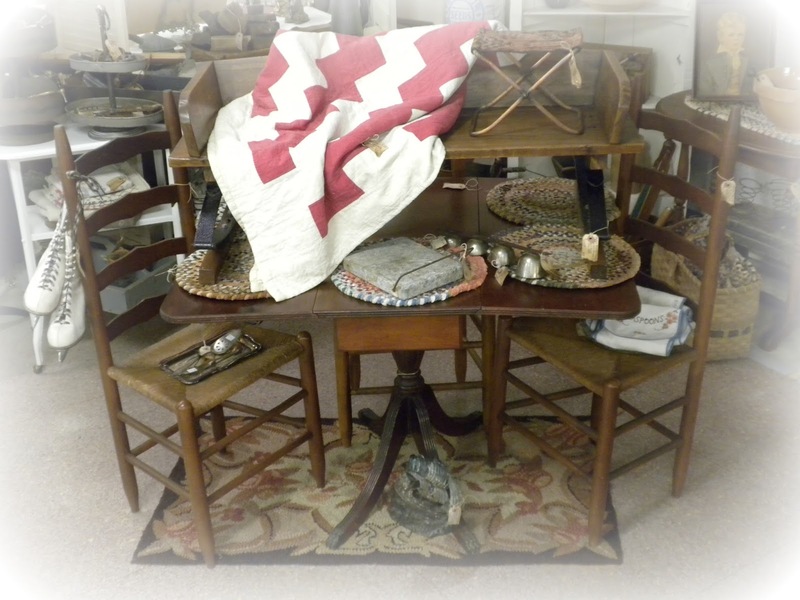 Below the table is the chippy sled sourced during Panoply's Longest Yard Sale trip, a third pair of vintage ice skates, and crazy quilted pillows in a basket. 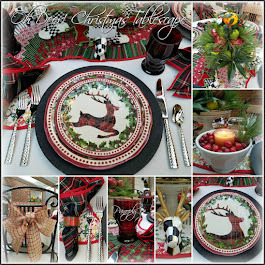 We also made efforts in terms of textiles, adding holiday linens, both casual and formal, which are easy to spot with the pops of red and green throughout. 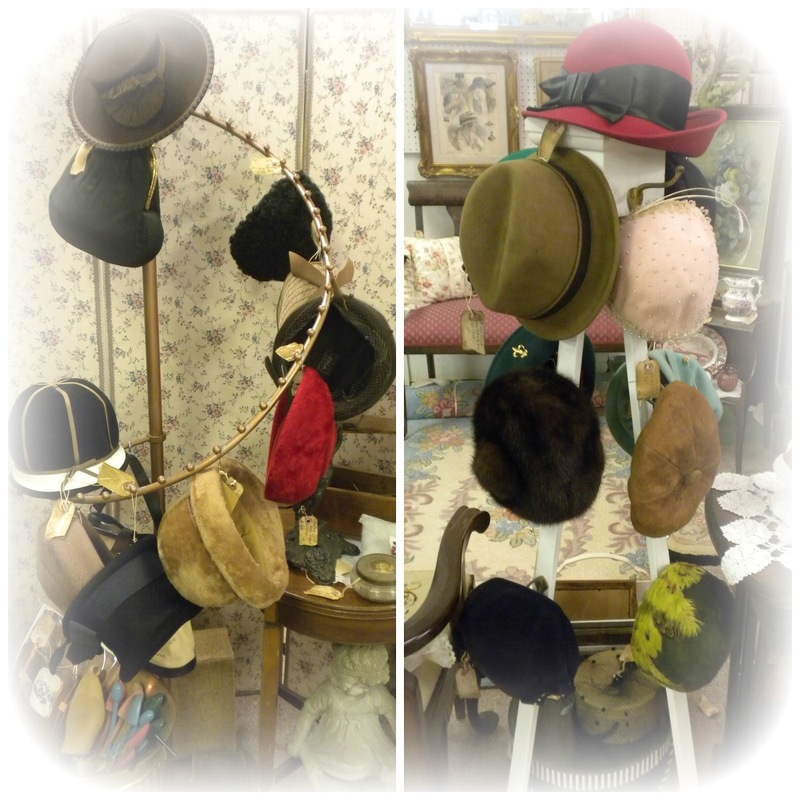 We also switched out all the vintage, summery hats for winter styled hats. 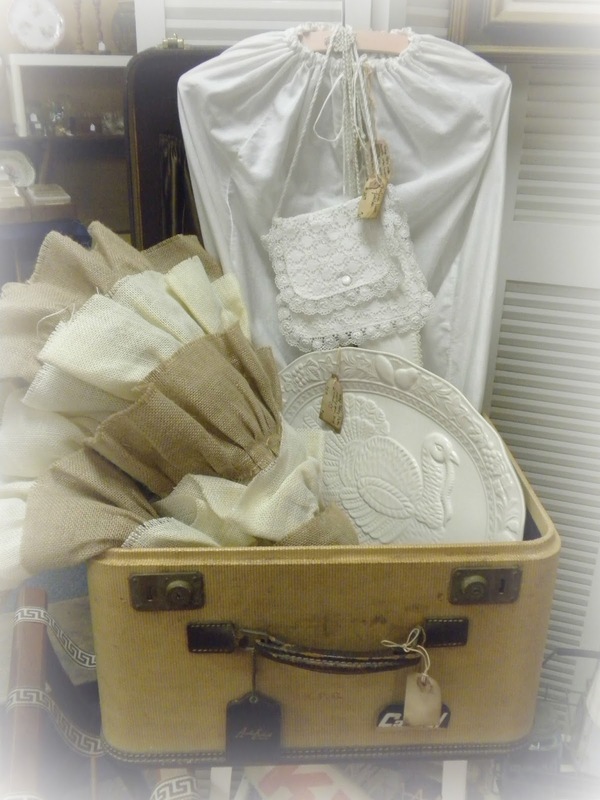 We had a ruffled, burlap tree skirt (new, not vintage) to possibly style our 'Chris Missy', but nixed it in the end, simply placing it in a vintage lingerie suitcase with a a few other neutrals. More holiday decor and gift items are yet to fill out our holiday vignettes around the trees, but we did unwrap and set many items already. The collage below captures most of those items staged so far. Needless to say, October was probably one of the busiest of Panoply's history, We did some major buying, purging, styling and creating during the month. We try not to refuse any formidable opportunities, as we are never sure when the pickin' will be slow, or when personal commitments will get in the way trump our time we dedicate to our antiquing hobby. I have yet another buying opportunity we were invited to at the end of October, and I'll be sharing it, but we're still negotiating. I'll be publishing a post on how we created 'Chris Missy' in a couple of days, so be sure to check back if you're interested in the step-by-step tutorial and ideas used. 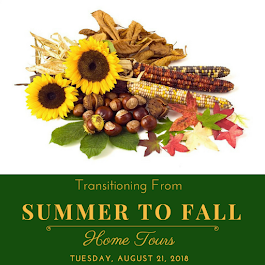 The concept of this tree is not new, as there are many of these type trees styled by others, whether you check Pinterest, read blogs, or visit major retailers such as Anthropologie. I'll be sharing how we created ours so you can see just how basic (or elaborate) you can develop the concept. 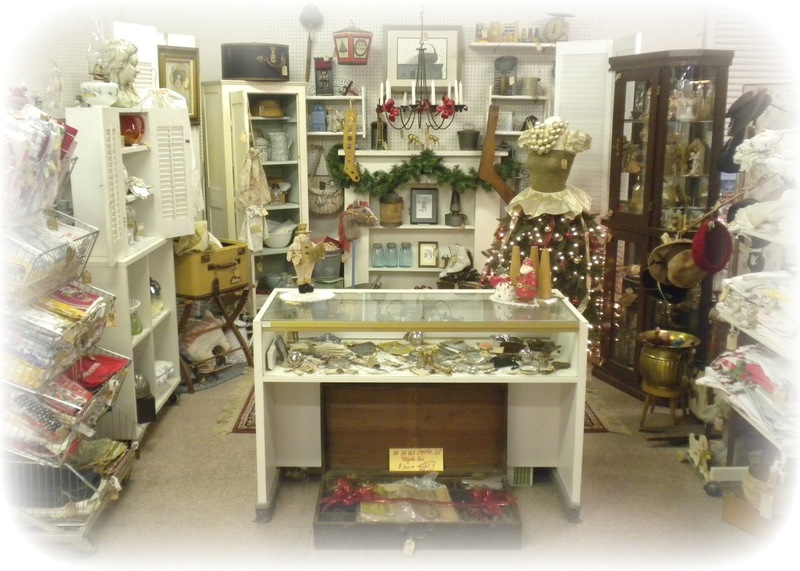 As mentioned before in posts of this nature (where we style our antique mall booth spaces), you can read more on this theme by typing keywords such as 'booth spaces' in the search block above my profile picture on my sidebar. A number of prior posts should come up for you to scroll and read at your leisure.